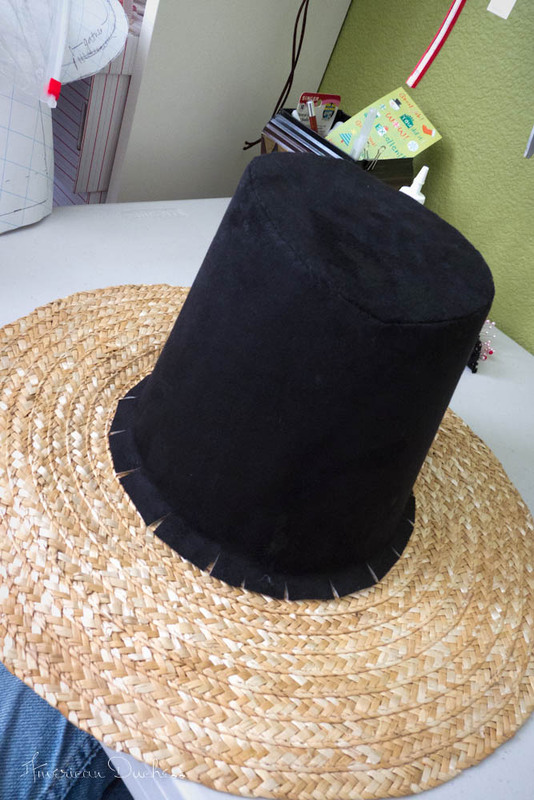 For the basic hat construction, I chose to cover a straw base. I chose a velveteen-suede-ish material with a batting back, which saved me buying extra felt to sandwich between the straw and the fabric. To heighten the crown, I got cross stitch plastic, which is flexible but also strong. I got mine in black, but I recommend getting a color you can see a marking pen on. I used the existing crown of the straw hat for a base and wrapped my plastic mesh around it, trimming and patching with extra plastic as needed, and forming a slanted sort of cone. 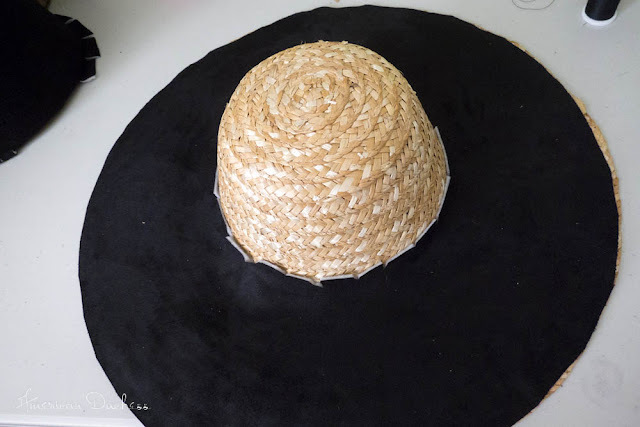 Unfurling the cone, I could trace the shape of it onto my fabric, and also mark out my circular crown top. 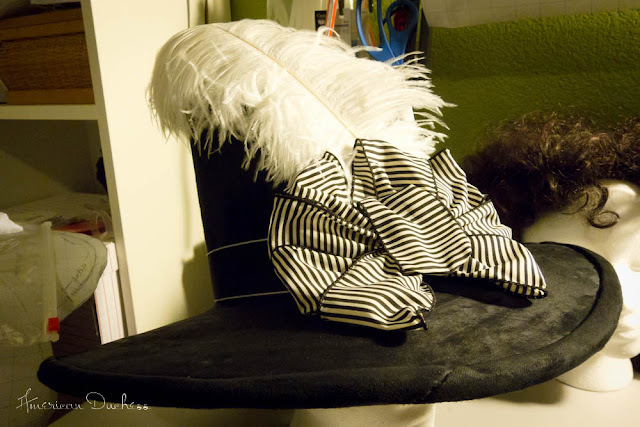 Both pieces were covered in fabric, using the Glue Of The Gods (hot glue), and fabric glue. 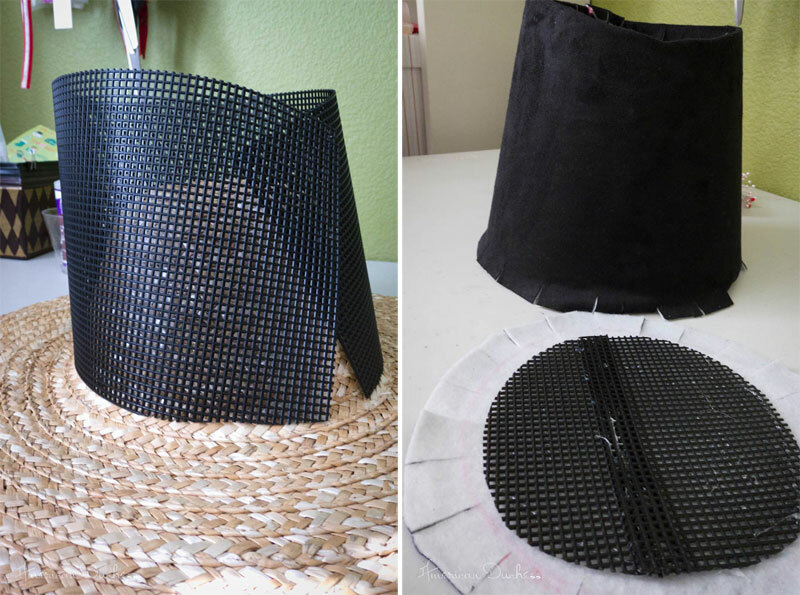 To match the crown to the crown top, I turned in the fabric tabs, then seated the top into crown, using hot glue to adhere the fabric tabs on the inside. Then I whipstitched around the top, on the outside, which makes for a lovely, clean, strong edge. Then it came time to cover the brim - no easy task! 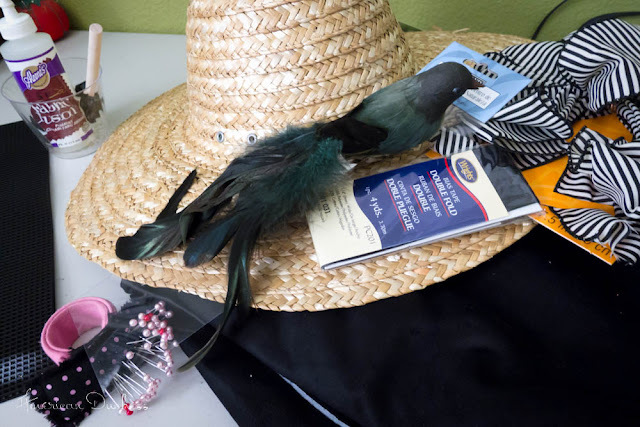 As many of you know, if you have a hat that will have a curved brim of any kind, covering in fabric can be a right royal mess. I thought I could best it with fabric glue painted on the straw, but the glue oozed through the fabric in places, leaving spots, and generally didn't adhere the way I needed. 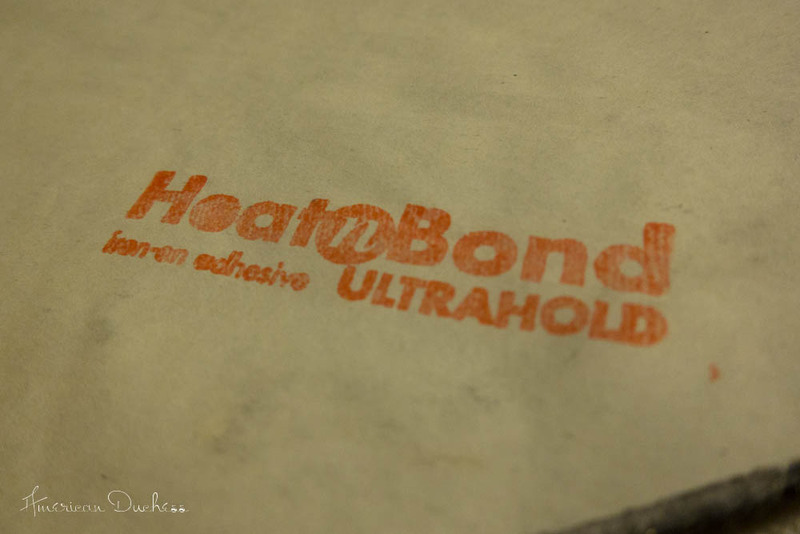 I ended up using Heat n Bond, a double-sided fusible. 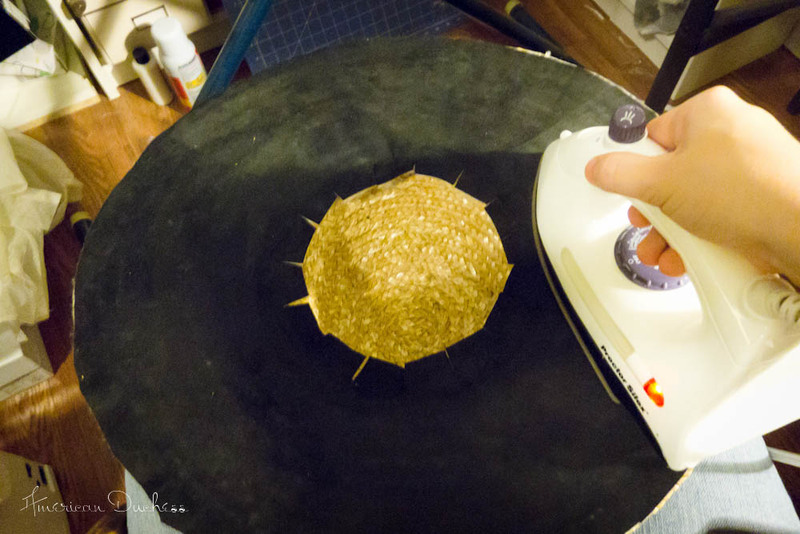 Unfortunately, ironing the brim to death meant the straw ridges now show through. Next time I will use a spray adhesive/cement! The left-over glue spots also still show, but instead of being supremely bummed, I'll just imagine it's water spotting and "age," such as one might acquire walking through the drippy streets of Paris in 1790. And then on to trimmings! I really wanted to use the green bird, but ended up not. I like the stripey "Halloween" bow so much, though, I might go back for another, and also some black feathers. You are amazing, woman! :) So pretty. Excellent job! How clever and what a clever use of plastic cross stitch canvas! 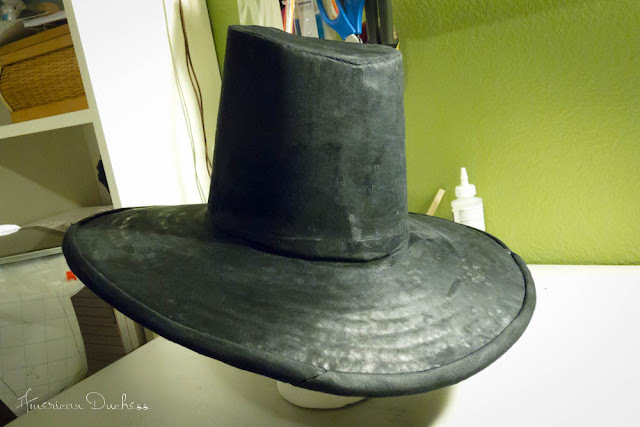 I love making hats and recently discovered this stuff called FAst2fuse, which is a super stiff vilene with fusible on both sides, and it's easy to make hats with cos you just fuse the fashion fabric on both sides. 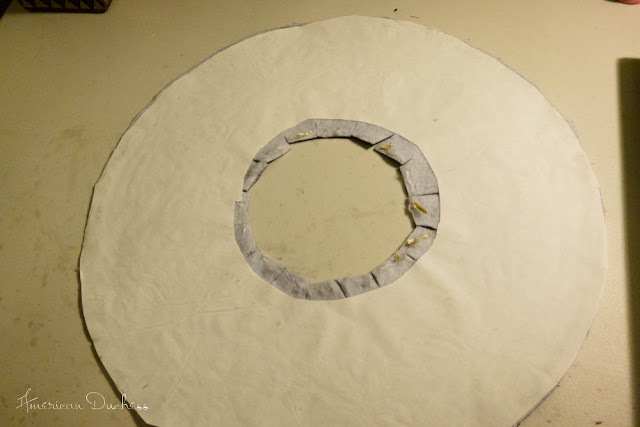 It was a huge revelation after struggling with one side fusible vilene or buckram for so long! Omg I NEED some of that!! I loathe doing the brims on covered hats because of the fusing problem. I look forward to using this Fast2Fuse stuff. Thank you so mch for the tip! This is a great tutorial. I've been thinking of fixing up a straw hat for a while, and this inspires me to do it, when I have more time! I'm thinking more of a low top wide brim one, although I'm not sure of the era. or maybe a bonnet. Fabulous! You did a wonderful job on that hat!!! Love it! I'm wearing a robe a l'anglaise for Halloween and want to make a Gainsborough style witch's hat. This is just what I need! One question, though. How did you get the brim to curve? Did you wire it or did you preform the straw? Thanks!